Sundar Pichai is an Indian American business executive who is better known as the CEO (Chief Executive Officer) of technology giant, Google. He joined Google in 2004, where he led the product management and innovation efforts for a suite of Google’s client software products, including Google Chrome, Chrome OS and Google Drive. He is one of the wealthiest people with a total net worth of $1.2 billion as of 2017. He holds dual citizenship of Indian and American. 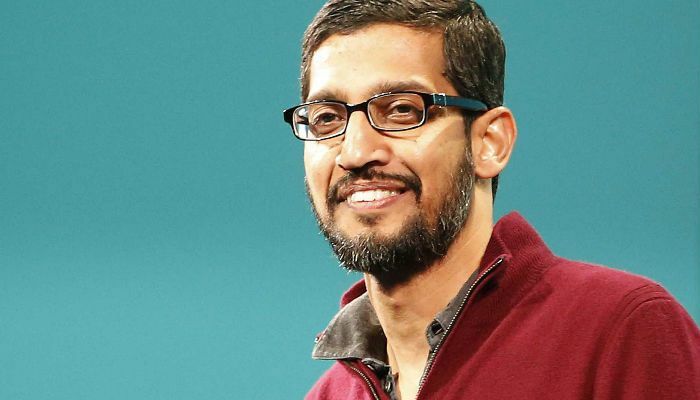 Sundar Pichai was born on 12 July 1972, in Madurai, Tamil Nadu, India. He is currently 46 years old. Sundar Pichai attended Jawahar Vidyalaya, a Central Board of Secondary Education school in Ashok Nagar, Chennai till 10th and completed higher secondary education from Vana Vani school inside the campus Indian Institute of Technology Madras. Pichai received his degree in Metallurgical Engineering from Indian Institute of Technology Kharagpur, West Bengal. He then enrolled at the Stanford University in California, USA from where he earned his Masters in Science in Material Sciences and Engineering. He holds a MBA from the Wharton School of the University of Pennsylvania, where he was named a Siebel Scholar and a Palmer Scholar, respectively. Siblings – He has one younger brother. 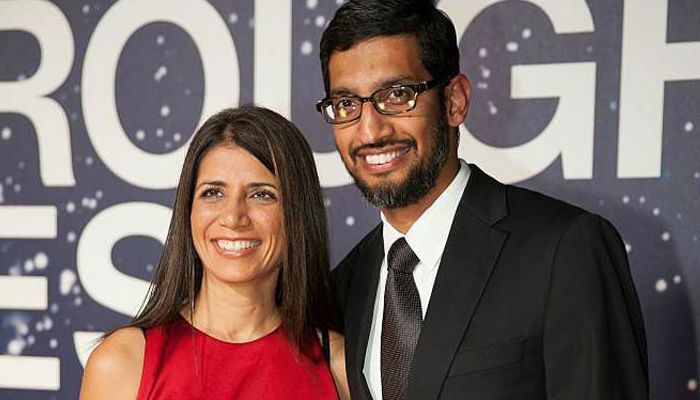 Pichai is married to Anjali Pichai and has two children – son Kiran and daughter Kavya. He first met his wife while pursuing his engineering at IIT Kharagpur, where she studied chemical engineering. She was from Rajasthan, India. After that, he moved to the US for his masters while she worked as a business executive for Accenture. During that time, they barely talked with each other. After three years, she managed to get a job there and moved to USA and they later married. After graduation, Pichai worked as a Management Consultant for Mckinesy & Company and joined Google in 2004. There he was largely responsible for product management and development of several business suites and client software like Google Chrome, Chrome OS, Gmail, Google Maps and Google Drive. He launched Chrome OS in 2011 and went on for public use in 2012. Besides overseeing many Google Products, Sundar Pichai became the head of Android the following year, which was formerly overseen by Any Rubin, co-founder of Android. He served various positions there, including the director of Jive Software before he was chosen as the next CEO of Google on 10th August 2015. The move came as a major aspect of a rebuilding procedure which made Alphabet Inc. the parent organization of Google. He was appointed as the new CEO of Google in October 2015, and he is serving as the CEO of the company since then. He hasn’t acted in any film. Pichai has appeared in quite a few documentaries, including Click (2014), The Android King: Sundar Pichai (2015) as well as hosted the Breakthrough Prize Ceremony in 2015. In India, he made his appearance on Star India, where he was interviewed by Bollywood star Shah Rukh Khan on Ted Talks India: Nayi Soch – Episode 4 through Beam Pro Telepresence technology. He has a net worth of $1.2 billion as of 2017 that has seen a stupendous rise after he was appointed as the CEO of Google. He’s well paid for hos work and his compensation includes three components – salary, bonus and stocks. In 2015, he made roughly $100 million as compensation with his basic salary $652,500, bonus $23,000 and restricted stocks of $99 million. In 2016, Pichai received roughly $183 million in company stock, which according to Bloomberg is the highest pay package that Google has ever given to an executive whose equity grants have been reported in filings. His compensation is over $200 million. He lives in a lavish 5-bedroom house that boasts all dazzling features including a tennis court, and a miniature football field for his son, located in Los Altos Hills, California. He bought this property roughly for $3 million. Besides, he also owns multiple properties in the US and India. During childhood, he aspired to become a cricketer as he is a huge fan of the sport. His family wasn’t wealthy, and the boys slept together in the living room of their two-room apartment. Growing up, he didn’t have a television or telephone. His parents got a rotary telephone when he was 12 years old. In fact, he is very good in memorizing phone numbers that he had ever dialed on their rotary phone. As a teenager, he got interested in technology and the first software program he wrote was a chess game. When he got to America, he couldn’t believe how expensive everything was — a backpack for $60! He had his interview at the Googleplex on April 1, 2004, the same day they launched Gmail. He thought that the free email service was one of Google’s infamous pranks. He first worked on Google Search Bar. In 2006, when Microsoft made Bing as browser’s default search engine, Google search bar got a big blow that made Pichai convince computer manufacturers to preinstall the Google toolbar to retain Google’s popularity with its users. He came up with an idea of building a dedicated browser for Google which persuaded Larry Page and Sergey Brin to accommodate the idea. Google Chrome is one of the most used browsers out there with more than 45% market share.